“Egg or sperm donors don’t help other people have children, they help other people have their children,” says Jennifer Lahl, founder and president of the Center for Bioethics and Culture. Lahl spoke with Catholic World Report about her work to assist the most defenseless affected by the rapidly changing and largely unregulated world of biotechnology. The CBC has produced three original, award-winning documentary films: Anonymous Father’s Day (2011), about children of sperm donors who long to know more about their biological fathers; Eggsploitation (2010), which uncovers the serious risks associated with human egg donation; and Lines That Divide (2009), focusing upon the stem-cell research debate. CWR: Your work at the Center for Bioethics and Culture tries to help the most vulnerable affected by biotechnology. Other than, say, “spare embryos” from IVF, who else are you looking to assist? Lahl: Our work focuses on end-of-life issues, like euthanasia, and “making life” issues via assisted reproductive technologies. The most vulnerable we seek to give a voice to are those facing terminal illness, disabilities, [the] suffering (those society says have a life not worth living), and also the stakeholders in assisted reproductive technology (ART), e.g., egg donors, surrogate mothers, and the children created by these technologies. Of course, we do advocate against sperm donation too, and it may be a stretch to say a sperm donor is vulnerable, but we seek to educate them on the realities of donor conception. I often say to egg donors (and it could be said of sperm donation), you didn’t help a woman (or a couple or man) have a baby, you helped her have your baby. CWR: The intense emotional desire to be a parent is the main motivation behind surrogacy and technologies like IVF. Your work, however, especially your films, focuses on different sets of emotions beyond those of potential parents. Tell us about those. Lahl: Our films are feature-length (versus shorts), partly because the complexities we lay out require more than your typical short film. What is really lacking in the discussions of ART [that deal with] with infertile couples (or even couples/individuals who use third-party reproductive technologies) is a fully orbed discussion of ALL the stakeholders. Buyer and sellers. Donors and recipients and, of course, the children. My background is nursing. I worked for over 20 years in nursing, primarily in pediatrics. I understand the realities of the medical risks and procedures to women and children. I read the data about these risks—known and unknown—and also about the reality that the majority of IVF cycles fail. I’ve taken care of preemie babies in intensive care units and seen the harm done to children born out of multiple births. Also, I’ve met and interviewed women seriously harmed by making the decision to “donate” their eggs, and children, now adults, conceived by donor conception who are not “alright,” like Hollywood purports. These stories, these voices, these facts demand to be included in the conversation. Sadly, the industry stakeholders only tell the happy stories of desperate couples who get children of their dreams. CWR: As more and more people are conceived through sperm donors or born of surrogate mothers, are there unexpected consequences playing out in the lives of these individuals? Lahl: I suppose one surprising thing that is happening is they’re finding each other via social media and online forums, so that they are building a community—working together, sharing their stories, which validates many of their thoughts and feelings. Typically, these people are told to be happy they were wanted. Be happy they are alive. Be thankful for these technologies which gave them life. And, of course, they are happy to be alive, but it’s valid and legitimate that they may not be pleased with the method of their conception. I remember doing our premiere screening of our film Anonymous Father’s Day in NYC. Many of the donor-conceived people in the film and in the social media world were on hand. While many of these people “knew” each other via emails and Facebook, etc., it was so fun for them all to meet each other in person, gathered around a common theme shared by them all. CWR: What sorts of resources are there for someone in this position who wishes to know more about his biological parent or parents? Lahl: DNA home-testing has really dropped in price and become affordable for many. So, along with DNA testing and groups like the donor sibling registry, people are making matches with biological parents and half-siblings. As these technologies become more prevalent and advanced, it really will be hard to keep anonymity a reality in third-party agreements. But of course all of this testing and matching depends on the child being told their conception story…. Many people do not tell their children they were conceived by donor eggs or sperm. CWR: Egg donation is on the rise, especially since women can be paid for their eggs. Are there risks involved for the donor? Lahl: I encourage all to watch Eggsploitation, where we outline the short- and long-term risks of egg donation. Naturally, any woman undergoing a surgical procedure to harvest her eggs [faces] all those risks—bleeding, infection, risks of anesthesia, risks of the drugs she takes to produce many eggs (egg donors typically produce upwards of 20, 40, 60 eggs at a time). The most serious short-term risk is Ovarian Hyperstimulation Syndrome (OHSS), which can cause strokes, organ failure, even, in rare cases, death. Young women (exactly the egg donor profile) are most susceptible to OHSS. And of course, unlike the infertile woman, who is treated like a patient, the egg donor is being paid to produce lots and lots of eggs, and is therefore more aggressively stimulated. Long-term risks are more problematic to identify, since we have not done the necessary studies on what I call the “healthy non-patient” egg donor. There are cancer risks from fertility drugs. There is the risk to the donor of lost or damaged fertility. 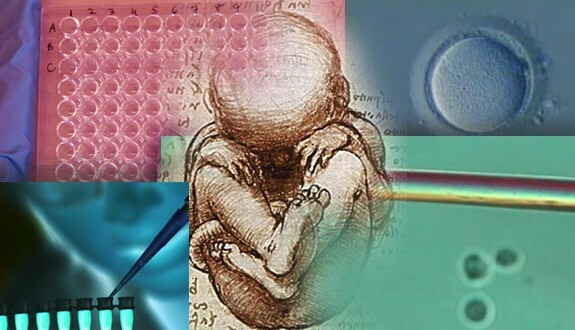 CWR: In general, the entire enterprise seems to be very risky, with only 19 percent of IVF treatments being effective, but also in terms of health and the well-being of the children created through these technologies. Is there any regulation of the industry to make people aware of the risks? Lahl: Sadly, there is no regulation in place to provide people with information about these risks. In my state of California we attempted to pass modest legislation which would have required egg-donor ads to have a warning label, similar to cigarettes, stating that no long-term studies have been done on this practice. The industry stakeholders (very wealthy and powerful) got involved and were able to gut the bill then-Governor Arnold Schwarzenegger signed, which said if you follow the American Society for Reproductive Medicine guidelines (which are meaningless and non-enforceable), you are exempt from placing warning labels on your ads. Of course all the agencies say they follow the guidelines. It shows the uphill battle we face in protecting and fully informing women.